Looking at my daughter in the store holding that really cool star shield and seeing how happy she was, there was obviously no other choice but to go with it. It's that time again. Actually, it seems to start earlier and earlier every year. The stores start stocking the shelves with masks, capes, costumes, and wigs. Unwitting parents go in for toilet paper or milk and somehow get stuck in the aisle of everything their kids want and then some. The Halloween extravaganza. We went to Walmart a couple of weeks ago and all the costumes were on full display. We were only there to look, not purchase. My 4-year-old had, up to this point, clearly and solidly decided on being a "Rainbow Butterfly" for Halloween. While a rainbow butterfly isn't exactly a specific character costume on the store shelves, I knew it wouldn't be hard to find all the fixings for something like that. Rainbow wings could be located and the rest would be easy. I thought I had the costume situation neatly wrapped up for this year. Phew! We went down the costume aisle to browse around for anything rainbowy or butterfly-ish. And that's when it happened. My daughter saw something that caught her eye and she ran towards it with glee. 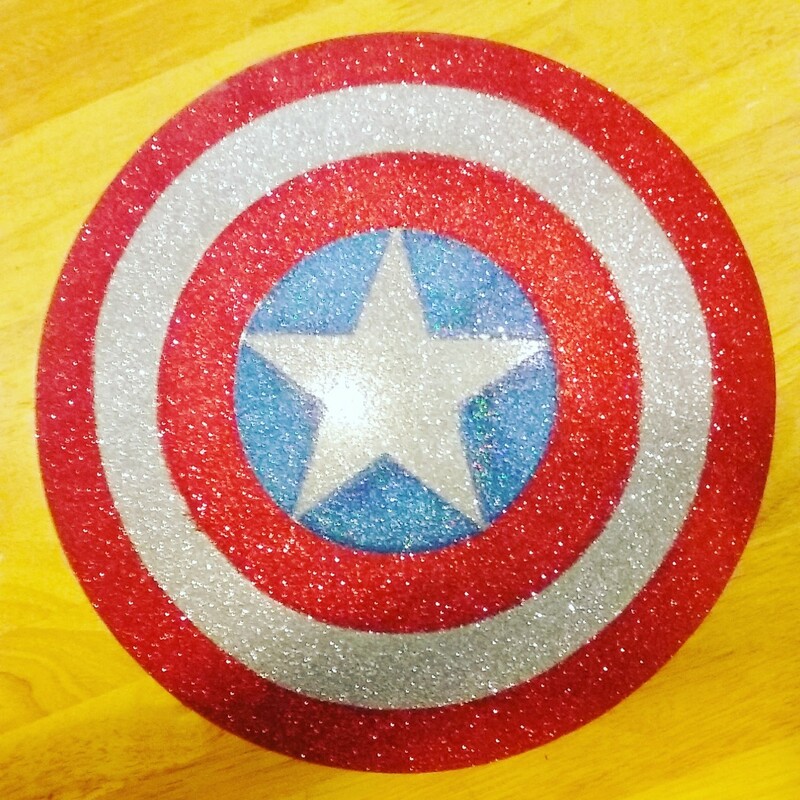 It was a Captain America shield. The fact that she loved the shield was nothing surprising. She loves stars and she loves blue. "Mama, I want to be Captain America for Halloween!!" I was at a loss for words in that moment. For one, I had no idea she even knew who Captain America was. For two, it was clearly a classic "boy costume". Now anyone who reads my blogs knows that my daughter has always been a fan of blue and is very much into the so-called "boy toys." But this was different. She was saying she wanted to be a specific boy character for Halloween and even though I consider myself to be progressive and open-minded, I definitely paused to consider what all of this might entail. She might be teased. She's in school now, so how would the other kids react when she shows up on Halloween at school in a "boy costume"? Yes, I know I shouldn't care. But I do care about my daughter's feelings. Even though I was totally sure she'd rock the outfit and pull off the Captain America costume, I have to admit that I was scared about how it would all play out. I know in the grand scheme of things this shouldn't be a big deal. I can almost hear certain people groaning as they read this, rushing to type comments about how this is so not something to worry about. Believe me, I would jump to tell any other parent not to stress about this kind of thing, but in that moment in the store, I didn't know what to say to my daughter. And that's why it bothered me. I wasn't prepared for my own uncomfortable reaction. Obviously, gender stereotyping was not something I was immune to after all. "I thought you wanted to be a rainbow butterfly?" I said, hesitating. "Well, this is what I want to be now." She proclaimed proudly. "Okay," I said, "Are you sure? We're only buying you one costume. No changing your mind." So we left the store and I prepared to buy a Captain America outfit the following weekend, even though technically it's considered a "boy costume." The next weekend, our whole family headed off to a big Halloween store to buy the kids their costumes. My daughter sat happily in the back of the car with her brother awaiting the purchase of her outfit and shield. I really think the shield was the selling point for her. She loves playing battle games with swords, shields, and weapons. "I'm ready for my Captain America costume!" my daughter said, with a big grin on her face. My husband and I just looked at each but said nothing. There was nothing to say. We weren't going to tell her she couldn't be Captain America but we weren't quite sure we were ready to send her out into the world in a "boy costume." Regardless, never once did we say to her, "No you can't be that it's for boys." In a previous article several months ago, I expressed that I feel girls and boys are very limited to the restraints adults have put on both clothing and toys as far as what's supposed to be appropriate for a specific gender. For instance, my daughter chose a backpack for school that was considered "boyish." She loved it and wanted it. The boys in her class fawn all over her backpack when she arrives because the characters on it are -- well -- kind of popular with boys. But they don't tease her as far as I know. They're still in preschool and they're sweet and innocent as can be. Most of them haven't been overly tainted by labels or judgments just yet. And so we ventured into the Halloween store. Fortunately, my awkwardness about my daughter being teased over a costume was taken away suddenly. Mainly because I was saved by another costume. Little did I know there is a female version of Captain America named "American Dream" and the store we went to that day had it. It's the same shield and outfit that looks just like Captain America only with a glitter shield and dress costume. My daughter ran to it. The glitter shield had her at hello. She was in love. And I was relieved. Shamefully relieved. 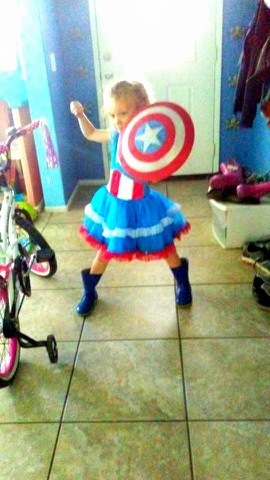 She calls herself "Captain America Girl." She's happy and can't wait for Halloween this year. I feel bad that I even hesitated over the "boy costume" scenario. I would like to think I would have let her go for it if we hadn't of found an alternative costume. I know that there will be plenty of other times my daughter challenges the perceived limitations of her gender in the future. This was just Halloween and she's only 4. I'm proud of my little girl. I hope she keeps putting me in situations that make me feel awkward and force me to think outside the box. She's become one of my greatest teachers in life. I wish I had reacted more courageously that day, but as with everything, it's a work in progress.